Dan Sheehan’s mother wanted her four children to study for an employable job; instead they chose the arts, with Dan’s youngest brother following him into a career in writing. This was, perhaps, inevitable. Dan lives in New York now. At 30, he’s married to the Orange Prize winning writer Téa Obreht, but he’s back in Dublin to publicise his debut novel. 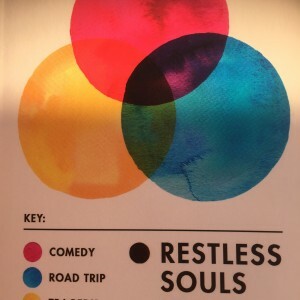 Described as a comedy, road trip and tragedy, Restless Souls is an astonishingly assured look at three friends battling to make sense of their lives, after a fourth, Gabriel, has taken his life. There were two images haunting Dan when he started his novel; the first was of library burning, and people struggling to save books; and the second was of an Irishman, hanging by his own hand. “Thankfully, nobody close to me has passed that way, but it’s always so prevalent. Nobody I know isn’t connected in some way to someone who has taken their life, whether close friends, cousins or siblings. It seemed to be constantly in the air when I was a teenager. He’s managed it beautifully. I love the structure – as it flits back and forwards, and a picture is gradually built of the friends as they develop from being teenagers when, with Gabriel as the protector, their futures seemed full of promise, through a sense of helplessness, and finally to, if not an assured future, at least a feeling of hope. The novel opens at Dublin airport as Karl and Baz wait to meet Tom, who, working as a pseudo war correspondent in Sarajevo, returns, a husk of his former self, haunted by the death of the woman he loves, and his memories of horror. Deciding to save their friend, Karl and Baz take him to a flaky sounding clinic that claims to cure the severest cases of PTSD caused by war. But they’re unlikely saviours – lost in life. The heartrending scenes during the siege of Sarajevo are meticulously researched. Since then he’s been drawn to documentaries and books about the conflict, and has also been curious about PTSD – and how, following every major conflict people become unmoored. “My mother works in an old British army hospital in Dublin. A lot of the men that have been there over the 20 years she has worked there have been Irishman for fought for Britain in World War 2. Fascinated by the latest treatments, Dan’s novel borrowed from the ideas of the neuroscientist Daniele Schiller. Dan has visited Sarajevo twice; once, in 2007, when he was on a cheap rail ticket around Europe, and again last year. “The city has recovered, physically, but I don’t know how long it takes psychologically and emotionally for a city to come to terms with something like that. I imagine, at least a generation. Working on a new novel, Dan is also re-configuring a collection of short stories that he started during the MFA in creative writing that he took at University College Dublin. But finding the time to write can be tricky. He currently works nine to five for a website called literary hub, but since arriving in New-York has done varied, and sometimes strange work. Dan met Téa five years ago at a festival run by the PEN American Centre, where he was working. They moved in together after four months, and married two months after that. As a teacher on the MFA programme at Hunter College, alongside Peter Carey and Colum McCann, she must, surely, have an influence on Dan’s work? For all that, Dan hasn’t the best writing routine. Restless Souls isn’t just a great read – it’s intriguing too. You come away from it with more curiosity about the issues Dan addresses. And that’s exactly what he hoped for. “I would never claim to be an authority on these subjects, but I spent an awfully long time researching them and they are important to me. I read fiction as a way to investigate social issues. That, I think, is one of the wonderful things fiction can do; to generate interest and empathy in these stories that aren’t your own. “If this book serves that purpose for anyone in those areas, that would be wonderful, because I think Sarajevo is a beautiful place that went through this horrendous tragedy, and it is not really spotlighted or spoken about. Restless Souls is published by Weidenfeld & Nicholson: €16.99. Kindle: €7.86.